Summary: Since 2004, the Comprehensive Florida Hawksbill Research and Conservation Program has been describing an aggregation of hawksbill turtles in the waters of Palm Beach County. This effort continues to provide some of the first data available concerning this Critically Endangered species in Florida. Since the study’s inception in 2004, 146 hawksbills have been tagged on the reefs adjacent to Central and Northern Palm Beach County. In order to understand the ecology of this aggregation in greater detail, we have begun to employ satellite telemetry to identify patterns of behavior, habitat utilization, and/or migration. In order to increase the sampling effort, we seek funding for the deployment and data management of one additional GPS-linked satellite transmitter. 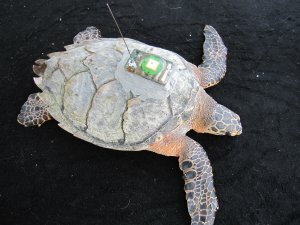 These devices have proven to be of great value to in-water sea turtle research, and their continued deployment will contribute significantly to the ongoing recovery effort for this species in Florida. Results: Hawksbills were encountered in all months, individuals are observed year-round. nearly 80% of subsequent observations were within 2 km of each dive site where they were last observed, and for 38.4% at the same dive site. Average interval between sightings more than 2 years.